Here we are, day two of our Great American BBQ week! Yesterday I shared with you my dad's Sweet and Spicy BBQ Sauce recipe! Today we are going to be using that sauce to make some DELICIOUS and SUCCULENT Grilled BBQ Chicken Thighs. 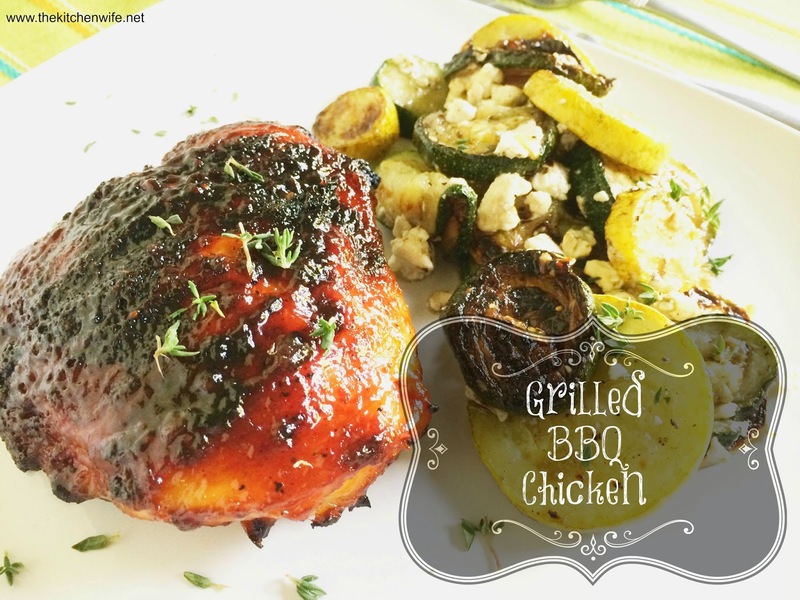 I know that grilling bone-in chicken can be a little scary, but I have a foolproof way to get it perfect EVERY time! As I mentioned before, I have a foolproof way to make sure that the chicken is juicy, tender, and fully cooked on the inside, while making sure the skin is perfectly crisp on the outside. That secret? We are going to bake these thighs in the oven before we grill them. This also makes it nice, because you can get a large part of the work done ahead of time and finish it off on the grill when your guests arrive. So, to start things off, you will need to pre-heat your oven to 375 degrees. While your oven is pre-heating, go ahead and trim the excess skin off of your chicken thighs. After you have placed the thighs on the baking sheet, pour and excess sauce over them. After 30 minutes, remove from the oven. Now it is time to head out to the grill. Before you put the chicken thighs on the grill, turn the burners on high for about 10 minutes. With a wire brush, scrape off any charred bits on the grate. Next, take a towel, dip it in oil, and swipe the grates. This will keep the chicken from sticking. Turn the burners to medium and lay the chicken thighs on the grate, skin side down. Close the lid and let them cook for 5 min. I like to give it one more baste, close the lid, and let it go for a couple more minutes. When it is finished, you will have this perfectly grilled chicken﻿ with juicy meat and crispy skin, encased in this perfectly caramelized sauce cocoon! OOOOHHHHH YEAH!!! Serve this with some lovely grilled zucchini and squash and you have a perfectly delicious summer meal! You can't go wrong with this dish! So call up your friends and family, fire up the grill, and get cooking! Trim excess skin from the chicken thighs. Cover with sauce, but reserve some sauce for basting later. Place the thighs on a baking sheet and put in the oven for thirty minutes. After 30 minutes, you will take the thighs out to a medium/high grill. Place the thighs, skin side down and let cook for 5 minutes. After 5 minutes, flips and baste with BBQ sauce. Close the lid and let cook for 5 more minutes. Flip one last time, baste, and cook for 5 more minutes. Flip, baste with sauce, and serve.